Make 2 litres (or 64 oz) of tea with 1 Tbsp gen mai cha and 2 Tbsp mei cha. To make the tea, boil water, allow it to cool for about 45 seconds, then pour it onto the tea leaves in a large teapot or similar vessel. Add the mint leaves to the mei cha and allow them to steep with the tea. Allow both teas to cool to room temperature, or for no longer than an hour. Squeeze lemons until you have 125 ml (or 4 oz) of juice. Strain the tea and the lemon juice through a fine sieve into a serving pitcher, and place it in the refrigerator. When cooling is complete, add sufficient stevia to sweeten the drink to your taste. Adjust lemon and tea volumes as necessary, i.e., make it taste good to you. Serve in chilled glasses, preferably without ice. 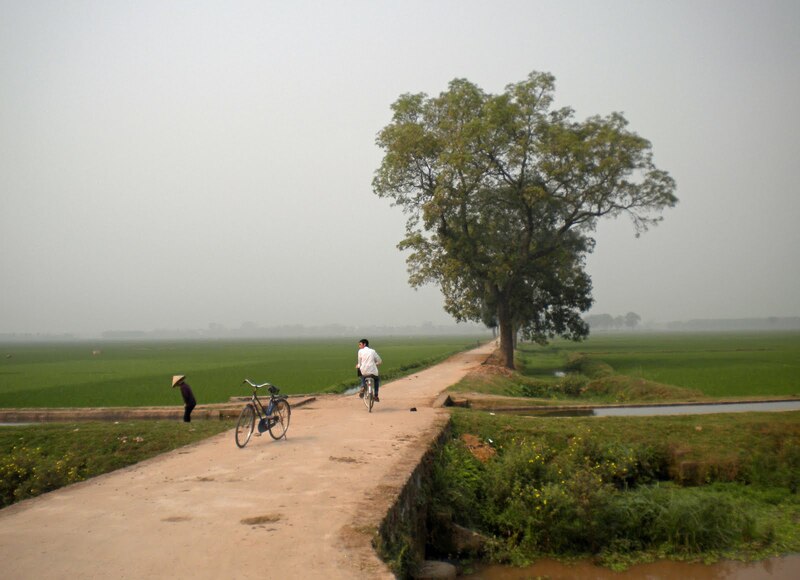 In 2009 we went to Vietnam on a bicycle tour. The weather was hot and humid. 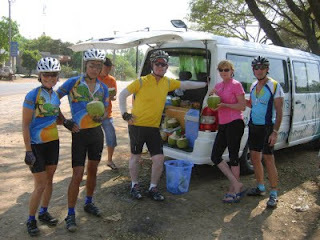 Our support crew stopped their van every now and then to provide us with extra water, snacks, and fruit. One day, I spied some green bottles on ice in the van and took one. It was a lemon-flavored iced green tea, sweetened with sugar, and deliciously refreshing. Every time we stopped I looked for that iced tea and took a bottle if it was offered. It was several days later that I overheard one of our guides scolding the crew for not charging $1 per bottle. Apparently, the iced tea was an extra. I kept drinking the iced tea, but paid for each bottle, and sneaked a few extra guilty dollars into the kitty. When we returned home and resumed our regular bike rides, I kept remembering that iced tea in Vietnam, and was determined to reproduce it as closely as possible. Then, when I started growing spearmint in a pot outside, I included a few leaves of it in the steeping tea. It proved even more popular than the plain lemon tea. We now keep a pitcher of "Summer's Sweet Icy Green" in the refrigerator at all times. It's a great favorite, even with people who don't cycle and who don't need to avoid sugar.